Badhaai Ho was one of the most refreshing comedies that Bollywood gave us in 2018. The movie went on to win critical praise as well as the audience's love. Starring Ayushamann Khurrana, Sanya Malhotra and Neena Gupta in lead roles the movie is up for many awards at many upcoming award shows. But the movie's nomination in the Best Original Story category at the Filmfare Awards 2019 has sparked a controversy. Writers Shantanu Srivastava and Akshat Ghildial have withdrawn their names from the said nomination. The reason they have cited is that they don't want to share the nomination with Jyoti Kapoor. 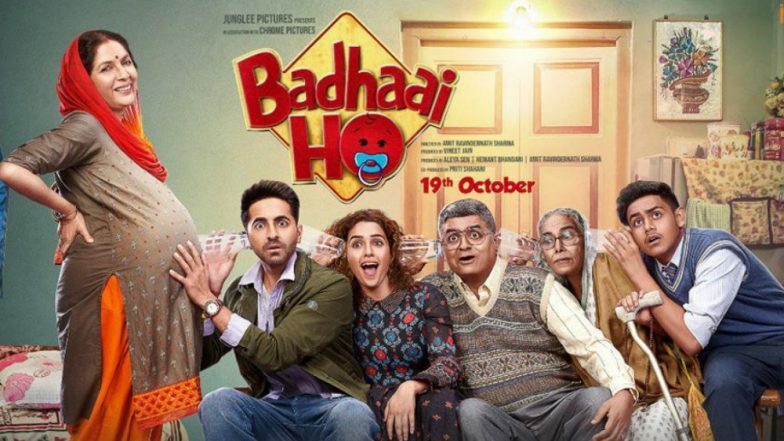 Rs 100 Crore Club: Ayushmann Khurrana Starrer 'Badhaai Ho' Crosses The Mark on 17th Day. Jyoti Kapoor was credited as additional story writer in Badhaai Ho. But Shantanu and Akshat say they she had no role to play in writing the film. For Jyoti, the struggle has been entirely different. She says that the concept of Badhaai Ho is similar to a story titled, Hum Do Humare Chaar, that she was developing for Junglee Pictures. The studio, however, went ahead with the script written by Shantanu and Akshat, after Amit Sharma came on board as the director. After Dangal, Badhaai Ho and Photograph, Sanya Malhotra Signs Her Next Project With Aditya Roy Kapur - Read Details. Jyoti, said in an interview with Firstpost, that she took the matter to higher bosses and asked to be credited if any of part of her story lands in Badhaai Ho. She was terminated thereafter and relieved from her contract. But Jyoti says that she made sure she got a credit in the film. Then Filmfare nominations were announced from where Jyoti's name was removed. She took to her Facebook page and expressed her grievance. The post went viral. And Filmfare might or might not be considering to put Jyoti's name back. The other two writers have taken a call and said that they will not share the credit. Jyoti has said that she is ready to take the matter to The Screenwriters Association and is ready to fight the legal battle if necessary. Shantanu, in an interview with Pinkvilla, maintained that the entire story was written by him and Akshat.